Two New Eatery Finds in Ladera Ranch, Both Fantastic! How about a friendly family restaurant, open 24 hrs/day, serves breakfast anytime, and everything is home made. 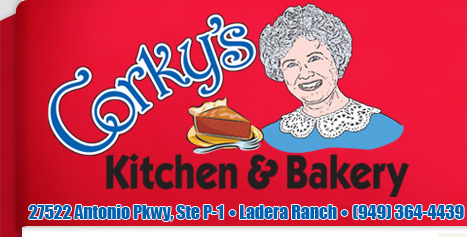 I happened by Corky’s Restaurant and Bakery a few days ago and woohoo, my new go-to casual restaurant. I had the Pot Roast dinner – out of this world. Chunks of flavorful, tender beef, and in case you were wondering, no gristle. Included a large dinner roll (fantastic! ), delicious mashed potatoes with gravy, and salad or soup. I chose the soup of the day, tortilla soup – home made, fresh, wonderful. $9.99. Warning! Their portions are huge. Unless you’re a voracious eater, plan to share it or take some home with you. The hot fudge brownie with ice cream is $6.99 but could feed 4 people. Omelettes? Haven’t tried one yet, but they use 5 eggs. They’re not making up for poor quality with quantity – no siree Bob! It’s the delicious, fresh home cooked meals I remember from my childhood. Don’t believe me – read the reviews on their site, found under each of the meal menus on the left column. I’ll start you off here with their breakfast menu. Click on Read Comments. 27522 Antonio Parkway, Ladera Ranch, 949-364-4439 (located at Crown Valley & Antonio in shopping center on the east side of Antonio). This hot dog joint is what I consider to be a wave of new-wave hot dog/sausage eateries opening up lately. Another one is Berkeley Dog, which I’ve heard is good but haven’t been there yet. They’re located at 25522 Marguerite Pkwy. #101, Mission Viejo, CA, 92692, (949) 455-1888. (At Oso & Marguerite near Rubio’s & Del Taco). At Jerry’s Dogs, I ordered the hot dog with grilled peppers and onions with mushrooms. Probably the best hot dog I’ve every had. They also serve these hot potato chips, and they’re excellent. I heard two different customers while I was there exclaim “I just LOVE them!”. Lots of hot dog/sausage and toppings to choose from. Here’s their website. I’m interested to hear your feedback. If you’ve tried any of these restaurants, including Berkeley Dog, or others in the Saddleback area that deserve a rave, please comment below.